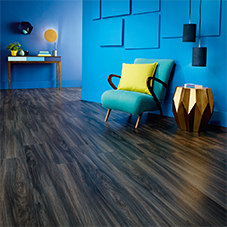 Amtico Access is a range of loose lay luxury vinyl tiling designed perfectly to compliment their extensive range of carpet and other LVT collections. The Access Collection is specifically manufactured to match the height of Amtico’s Carpet tiles, ensuring the collection is an ideal choice for multi-use commercial environments. This allows two different types of flooring to be laid together at similar heights, enabling spaces to be easily zoned for specific purposes. Combining Amtico Access with Amtico Carpet saves time with installation, as Access is a fast fitting, loose lay flooring that can be laid with or without adhesive. It can be lifted repeatedly for maintenance or redesigns, and then quickly refitted, which makes it ideal for commercial environments such as offices. 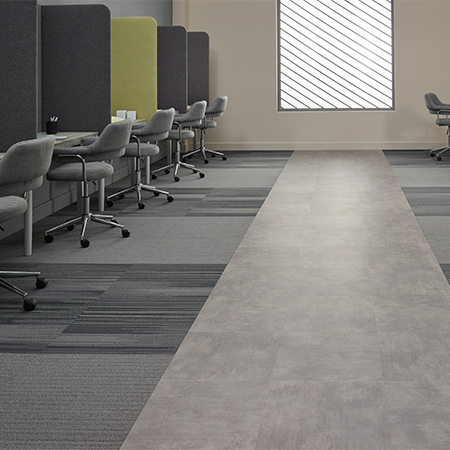 Amtico Carpet's modular design and larger tile size also allow for rapid installation across large areas. With Amtico Access, you can lay the vinyl tile directly onto existing subfloors including concrete, wood, or raised access flooring panels. It is available in 43 modern wood, stone and abstract designs, all featuring a durable 0.5mm wear layer. Amtico Carpet comprises 11 individual collections, 22 designs and 106 colourways, providing an extensive range of contemporary commercial flooring. They are both supplied with a 10 year commercial warranty.